Scorching temperatures setting new meteorological records and wild winds up to 100 km per hour have caused hellish bushfires across the state of Victoria in south east Australia on Saturday February 7. The bushfires have caused more than 181 deaths with the death toll continuing to rise as more bodies are discovered. The final death toll may approach 300. Climate change has been identified as a contributing factor in increasing bushfire severity and intensity. 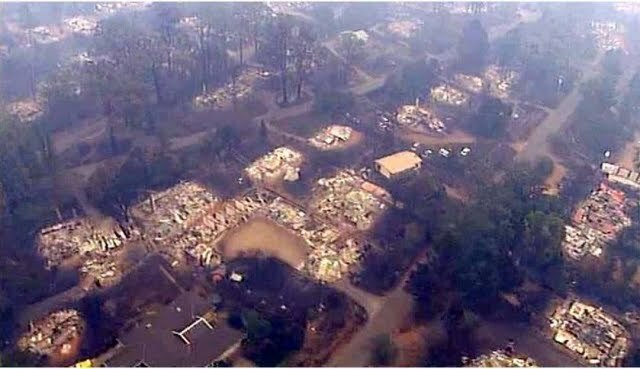 The bushfire disaster eclipses the Ash Wednesday bushfires of 1983 toll when 75 people died in New South Wales and Victoria. Senior NSW Bureau of Meteorology (BoM) climatologist Perry Wiles said on February 5 "Climate change is not only increasing average temperatures, but also the frequency and severity of extreme temperature events," Mr Wiles said in a statement. "While any one event cannot be attributed to climate change, this heat wave is certainly consistent with that expectation. In a warming world we can expect similar extreme events more often." Scorching temperatures in Victoria - Melbourne and several regional towns reached more than 46 degrees Celsius (116 degrees Fahrenheit) - and high gusting winds up to 100km per hour fanned bushfires. Marysville in the Kinglake area just north of Melbourne was totally obliterated by the fire. More than 3000 firefighters fought the blazes across the state with over 700 homes destroyed, 550 of them in the Kinglake area. The bushfire disaster eclipses the Ash Wednesday bushfire of 1983 when 75 people died in NSW and Victoria. A cool change eventuated on Saturday night, but many fires in Victoria, including the Beechworth, Murrindindi and Kilmore regions, are still out of control and pose a significant threat, according to the Country Fire Authority Incidents list. 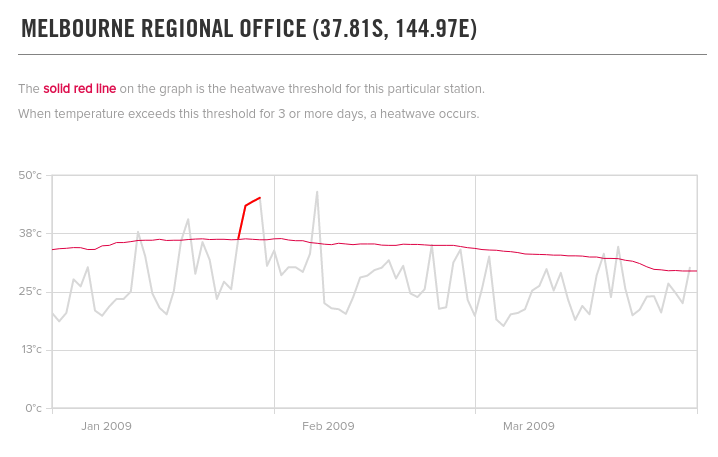 In western Sydney on Saturday the temperature peaked at 42 degrees. Current bushfire incidents, graded as class 3, presently being fought in NSW include the Bega Valley, Peats Ridge near Gosford, Muswellbrook, Singleton, and Tumut. Most regions of NSW and Victoria have a Total Fire Ban in effect. Sydney's northern suburbs was covered in clouds of smoke from a blaze near Lake Macquarie. 60 firefighters worked to control this fire "They are doing a lot of back burning on that fire overnight, and that is what we are starting to see causing smoke to enter the Sydney Basin, especially in the northern suburbs," said Inspector Ben Shepard from the Rural Fire Service. During this heatwave many locations in southern and south-western NSW have reached or exceeded their records for consecutive days at or over 35 or 40 degrees, according to the Bureau of Meteorology. 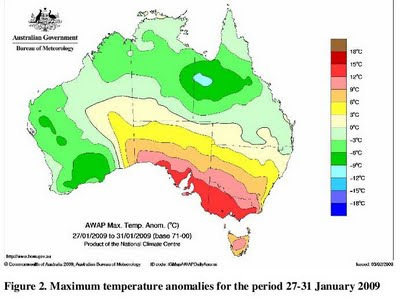 “Record or no record, this heat wave has been extremely hot and unusually long” Ms. Agata Imielska, a climatologist with the NSW office of Bureau of Meteorology, said. * Tasmania’s highest temperature on record – with site records broken by large margins in northern and eastern parts of the island. * Highest temperatures recorded in much of Victoria and southern South Australia since 1939 with Adelaide only missing recording their highest maximum temperature by a small margin. Melbourne recorded a new record temperature of 46.4 degrees on February 7. * Adelaide experienced the highest minimum temperature on record at 33.9 degrees on January 29. * The long duration of the event – with records reached for consecutive days over 43 at Adelaide (4) and Melbourne (3). Hospital emergency departments are recording an upsurge in heat related illness and deaths. Record temperatures and bushfires have also damaged powerlines leading to blackouts, and stressing rail public transport systems. The high temperatures on Saturday however did not overburden the electricity power systems as most industrial users had closed down for the weekend. Greens Leader, Senator Bob Brown told Sky News "Global warming is predicted to make this sort of event happen 25 per cent, 50 per cent more. It's a sobering reminder of the need for this nation and the whole world to act and put at a priority our need to tackle climate change." In December 2008 Prime Minister Kevin Rudd announced that the Australian Federal government will cut Australia's carbon emissions by five per cent by 2020 and give billions in greenhouse credits to polluting industries. The low level cuts were denounced by Damien Lawson of Friends of the Earth: "A five per cent target locks Australia into runaway climate change. This target will not stop drought, it will not save the Great Barrier Reef, and it will not prevent ice melting and the sea rising," Mr Lawson said. "This is an emergency and the government must act within this term. Our carbon emissions must peak in the next year and then continuously decrease if we are to have any hope of avoiding catastrophic climate change." According to Mr Lawson emissions cuts of 40 to 50 per cent by 2020 were needed, and he also called for a 100 per cent switch to renewable energy by the same year. Temperatures for Melbourne Jan-March 2009 showing the late January heatwave and the 46C temperature spike on February 7, 2009.